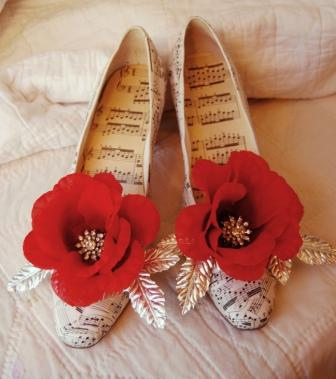 Love these shoes, from Flickr user sassyarts. I think they’re perfect for today’s query from A.P. Let it begin! If Junie Baltimore had listened to the old transistor radio in her parent’ restaurant, she would have heard the song and known that it was always meant for her. Three years ago, Junie dared him to write a song with all perfect notes. In return, Rob Montgomery simply asked her out on a date. She ran. Now, Junie finds herself running again. This time she’s running from the memory of her ex—Caspian—who left her so heartbroken, German chocolate will never taste the same. Coping, she finds comfort in the only place she knows—the kitchen. But when her parents catch her baking two-hundred lemon tarts at 4am, and they unanimously decide that she needs a vacation—come heartbreak or high water! That vacation lands her in Myrtle Beach, South Carolina, where childhood memories Black Bangle Pirates and Lollipop Princesses cling to the beaches like sticky cotton candy. Here, Junie comes face-to-face with the all-but-forgotten Rob Montgomery. But it’s been three years since they’d last met, and while she finds herself yearning for the greasy-haired boy she left behind, this new heartthrob might be everything she needs to forget the taste of Caspian Gardener. With help from her kooky parents, a misfit cast of beach natives, and some orgasmic Chocolate Murder Pancakes, can Junie finally stop running from the long-lost boy with electric eyes and a Cheshire smile, or will she possibly miss out on the best song in her life? This is the story of Junie Baltimore as she races against a whirlwind of obstacles—including a reappearance from her ex and a category three hurricane—to finally hear that song with all perfect notes. Combining the wit of Meg Cabot and the heart of Sarah Dessen, JUNEBUG is a 63,000-word YA romance about running away, and the courage it takes to face the consequences. The full manuscript of JUNEBUG is available upon request. This kinda feels like the plot of a Nicholas Sparks novel to me. And while that’s not necessarily bad — nor is it entirely accurate, since no one seems to have a wasting disease — it feels a little generic. Let me see if I can boil down the plot: girl scared of love re-meets cute with former flame turned hottie, with music and cooking. As for the music, what does “all perfect notes” even mean? Also, you tell me about “kooky parents” and “misfit” beach natives — what’s kooky and misfit about them? And how does Junie relate to them? There’s a typo in the first sentence — you either mean “parent’s restaurant” or “parent’s restaurant”, depending on how many parents run the restaurant, but “parent’ restaurant” isn’t a thing. The next paragraph makes Junie seem certifiably crazy. Someone asks her out on a date and she ran? That’s… weird. The rest of the paragraph has three sentences in a row with clauses or words set off by dashes. I use them a lot myself, as you can see in my response, but one after the other feels awkward. And I really hate exclamation points in a query. Heartbreak or high water! Oh god, no! Also, she’s already heartbroken, according to that same paragraph, so the impact of another heartbreak is kind of lost. In the next paragraph, there seems to be a word or two missing in the clause “where childhood memories Black Bangle Pirates and Lollipop Princesses cling to the beaches like sticky cotton candy.” Maybe “childhood memories of”? And are these food or people? With all the running and racing Junie does, I have to wonder if this is a thriller, or a romance. It feels a bit schizophrenic. I don’t know. I think this needs to be greatly simplified so an agent can see the heart of it, without having to plow through all the metaphors. Readers, I’m going to ask you to help A.P. out in the comments. How would you rewrite this? If 18-year-old Junie Baltimore had listened to the old transistor radio in her parents’ restaurant, she might have heard Rob’s song–and known that it was meant for her. Three years ago, Junie dared Rob Montgomery to write a song with all perfect notes, but when he wanted something more than friendship, she fled. Three years later, on the rebound from a failed relationship, Junie finds comfort in the kitchen. When her parents catch her baking two-hundred lemon tarts at 4am, they insist that she take a vacation. In Myrtle Beach, South Carolina, where childhood memories cling to the beaches like sticky cotton candy, Junie again meets Rob, now a successful songwriter. But Junie’s running scared–and she’s not completely over her ex. Will she reject Rob’s overtures and miss out on the best song of her life? I am seeking representation for JUNEBUG, a 63,000-word YA romance. I'm not the best at these, but here's my two cents. it looks like your first paragraph is all backstory. Does the action start 3 years prior? If not filter it back in – in one sentence, IMO. Start with the heart break. And we don't have the age of the character – it says YA but it almost felt like older. Seventeen year old(I'm assuming), Junie Baltimore is reeling from her sudden breakup with Caspian Gardner, ultra suave German exchange student(we need a one word or so description of who Crispian is and why she was attracted to him. I used German exchange student because of the other reference). The kitchen is the only place Junie finds comfort. Except now, German chocolate cake will never taste the same. When her four am power bake leaves her parents worried, they insist on a (Summer, spring break?) vacation to the beach. Myrtle Beach, filled with Black Bangle Pirates, Lollipop princesses, and Junie's one regret, is the last place she wants to be. When Rob Montgomery pops back into her life, Junie is ready to pack the camper and head home. Rob is certainly not the same awkward fourteen year old Junie asked to write a love song. In the three years since Junie stood Rob up at the Myrtle Beach boardwalk, Rob has turned into every girl's fantasy with electric eyes and a Chesire grin. Junebug is a 63,000 word YA romance filled with the eclectic characters of the South Carolina beach, a couple of kooky parents, and a second chance at the right guy. These are just my suggestions. i didn't use all the food refernces because I couldn't see where they fit in. And I used the song bit in the hook example, but I didn't really see how that fit in either. Sorry I wasn't more helpful. Even after baking two hundred lemon tarts at 4am, (insert age here) Junie Baltimore can't seem to cleanse her palate of the first love she's ever known. When her parents walk in on the lemony chaos they know Julie needs a break from the family restaurant. Now Julie is in Myrtle Beach where childhood memories cling to the walks like cotton candy. It’s when Julie runs into one of these memories, Rob Montgomery, that she knows this singer/song writer could be the cure or the curse for her mending heart. When a category three hurricane threatens to destroy Junie’s new found hope, she must fight to hear the song that was always meant for her. Without having read your manuscript, I don't know if this fits the tone of your book, but I tried. I think you can leave out Caspian's name in the query, it just clutters it, also I think you could sprinkle more details in than what I just wrote, but they need to flow. I really liked what Cate wrote in her last line. I also liked Ruth's example where she tied in the original hook, I just couldn't figure out how to make that part flow. This book does sound very Nicholas Sparks-ish to me too. It's sounds like it could be really cute if the characters/plot are unique enough, good luck with everything! "Junie is majorly heartbroken for the second time in three years, and copes in the only way she knows how- cooking. But after baking two hundred lemon tarts at 4am, Junie's parents stage an intervention, and whisk her away to Myrtle Beach, SC, the vacation spot of her childhood. There, surrounded by quirky beach natives, her eccentric parents and facing a category three hurricane, she re-unites with her first boyfriend, and must make the choice to stop running away from the love in her life." Is that correct? I know there is definitely more involved, such as Rob's songwriting, but between the music and cooking metaphors, it wasn't so clear. I think the key with any query (so much easier said than done) is to tell an agent what your story is basically about, show them why they should absolutely adore your MS, and leave them wanting to read (at least) the first 3(properly formatted, not attached)pages below. Good luck! “If 18-year-old Junie Baltimore had been listening to the old transistor radio in her family’s restaurant, she might have heard Rob Montgomery’s song—and known that it was meant for her. But it’s the night of Junie’s senior prom and her heart has just been put through the shredder by the hunky German exchange student who’d promised Junie he’d love her forever—right before she found him making out on the dance floor with the prom queen. Coping in the only way she knows how—baking 200 lemon tarts—Junie’s parents find her in the restaurant kitchen and stage an intervention. They whisk Junie away to the family’s favorite vacation spot, Myrtle Beach, SC, where Junie’s childhood memories cling to the sands like sticky cotton candy. At the beach, Junie re-unites with Rob, who had a major crush on her their freshman year. But Junie wasn’t ready for romance then. She ran when the gangly 14-year old budding musician told her he wanted to be more than friends. But Junie and Rob aren’t 14 anymore. Junie now knows what its like to have your heart smashed in two and Rob, now a successful songwriter, has no shortage of girls wanting to be in his arms. Luckily for Junie, Rob has never gotten over her. With a level 3 hurricane beating its way to the beach and Junie struggling to put back together the pieces of her broken heart, Junie Baltimore might just miss out on her second chance at first love. Thank you everyone for your input! I realize now what I should have inserted and left out. It's extremely difficult trying to sum up your own story. I feel slightly embarrassed, actually (especially with that first-sentence typo!). I'll gather all my information and regroup. Thank you so much!